Sony's eagerly-anticipated PlayStation 4 will soon be here to tackle Microsoft's mighty Xbox One, and to celebrate Sony has launched the 'Play The Players' programme at PS4 lounge in London's Covent Garden. 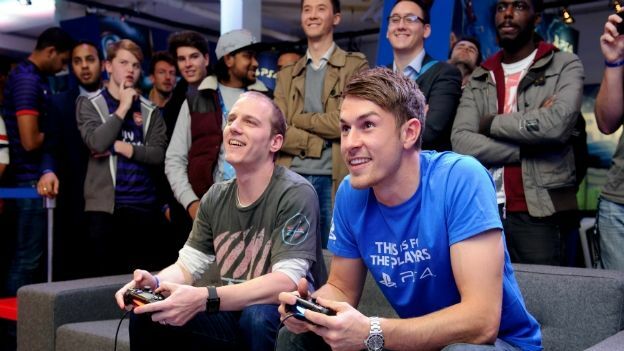 Arsenal and Wales football star Aaron Ramsey attracted huge crowds as they all waited their turn to battle it out on FIFA 14. The skilled midfielder has already proved himself this season with an impressive goal-scoring record but Thursday night proved he also had the gaming skills to match. Ramsey said: “I am a massive gaming fan and regularly play with my teammates on away trips, so I was really up for a bit of a challenge against the public on the PS4. Stage two of the programme will be on November 26 with gamers having the chance to take on British boxer Amir Khan. If you think your FIFA 14 skills are up to scratch and fancy taking him down, then Khan will be at the PS4 lounge at 17 Bedford Street, Covent Garden between 12:00 and 14:00. For more information on the PS4 Lounge, including announcements on the line up for 'Play The Players' and other exclusive events head to: https://www.facebook.com/playstation4lounge or follow @PSAccess on Twitter.